9:30 ish: Jonathan King starts us off. Makes reference to Ken Miller’s visit to MIT last spring, when he told his audience that despite the victory in Dover, the battle is far from over. That reminded me of something Stephen Jay Gould said after the Arkansas creationism trial in 1981 that in many views marked the legal end to old-style creationism as a potential competitor to evolution in the schools, paving the way for ID revisionism. Gould said then (I recall, though I can’t track down the cite right now) that the victory in that trial meant that the argument was over. Miller was right. 9:45 ish. John Durant, director of the MIT Museum up now, talking about the history of Darwin and Wallace. First point of emphasis: the theory of evolution by natural selection owes its origins to natural history over and above all other sources. We do molecular biology now to penetrate evolution; (which is what this symposium is mostly about), but without close and systematic observation of nature, we got nuthin. 9:55 ish: John makes the link between Darwin’s formulation of the problem of the apparent non-fixed nature of species, his reading of Malthus on the war between the tendency of populations to increase and the scarcity of resources, and his working out the idea that under such circumstances, favorable variations would be preserved and those less so would drop away, providing a mechanism for biological change (the exact quote went by to quickly for me to capture). All this in 1838, at which point Darwin says he now has a theory on which to work. Whch he does in secret…hence, says John, enter Alfred Russel Wallace. Wallace, John emphasizes, comes to the idea of natural selection relatively early in his natural history career — but has to collect the evidence to get there. His ill-luck extends to the loss of four years collecting in a ship wreck after his first voyage, but heads out again to what is now Indonesia (and a bit of Malaysia), and discovers the evidence, especially the biogeography (space, and not just time again…a theme is developing here) that crystallizes Wallace’s thinking. 10:05: John tells the story of the simultaeneous publication of Darwin and Wallace’s papers at the Linnean Society in 1858, after the shocking receipt by Darwin of Wallace’s writing in the post. That shock propels the writing of the actually quite brief Origin of Species, instead of what John calls the looming doorstop of what Darwin actually intended to produce. See this post and the link to John Wilkins on Wallace for a little more detail. 1006: A little of Huxley bashing by self professed Huxley fan John Durant, in dismissing Huxley’s claim that the theory was sufficiently obvious that he should have thought of it, the “duh!” reaction. 10:15: Lot of Wallace love in the brief Q & A. Of which I heartily approve. 10:20 Her interest is in understanding brain structure through evolutionary conservation. “Fruit Flies have a perfectly fine brain.” — now there’s a quote to be going on with. In fact she’s drawing attn. 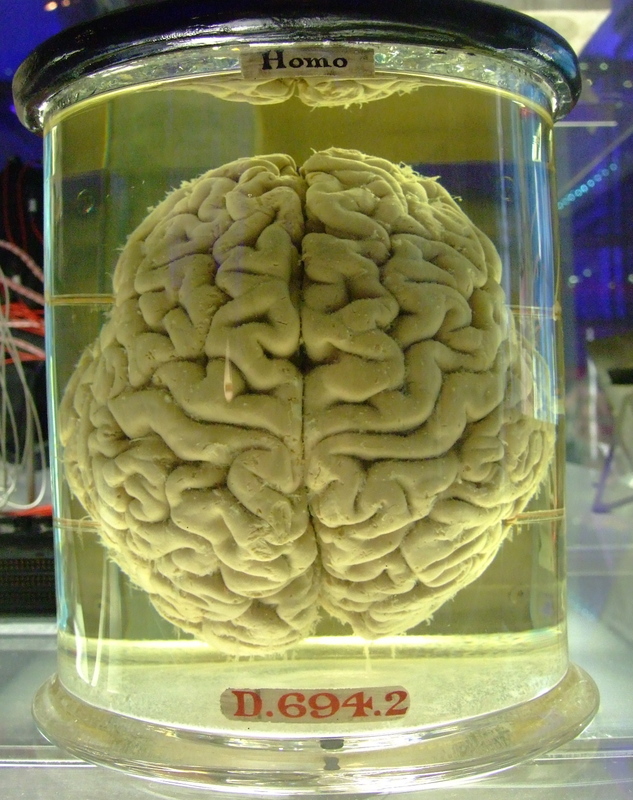 to the vertebrate brain’s structure as a tube, in contrast to the invertebrate brain structrure. It’s more fun in isolation. Sive takes us through a brief tour of brain birth defects as a wake-up call to the significance of specific structure. Then she gets to the first punch line: “Vertebrate brain structure is highly conserved. Slides range from zebrafish to human. Sive’s lab uses inter alia the zebrafish as a model organism for all this; check out the link for more. This is good public communication. For example, Sive’s discussion of the Snakehead (snk) mutant begins with her statement that they had found a mutant that appeared to have no brain. The discussion of the experiments that followed was clear, worked into pretty fine grained detail by smooth steps, but allowes an audience that includes a high school class from a nearby suburb right into the sequence of steps and thought about how this lab works out the relationship between brain structure and development and the insights to be gained from such thinking about brain defects. Nice stuff. In Q & A, starts to talk about the genetics of the ion pumps implicated in the snk mutant. Also, question comes whether if there are problems with brain tube folding, does that correlate with heart tube folding issues, and the answer is that there are correlations and/or shared folding programs going on. 10:45. In discussion of another experiment — on epithelial relaxation — Sive gives a hint of how cool (read technically sophisticated) the experiments in this work have to be. Imagine, she asks us, micro-dissection of brains in .2 mm long organisms. 10:50. Last thought on distinction between model and tool. The zebrafish is a tool — allows lab to do assays on ideas and molecules that may be relevant to humans. E.g. — studying autism and schizophrenia associated genes in fish, even though there is no thought that the fish will exhibit the behavior associated with those genes in humans. 11:08 Susan Lindquist is up now. Her questions: How do organisms stay the same? How do they change? No heavy lifting before lunch, eh? She is in fact going to confine herself to a narrower route into the large issues. She’s starting us off with two beautiful flowers: Mimulus lewisii and Mimulus cardinalis. They raise the question of how such different fertilization mechanisms that the two plants employ could evolve when the intermediate steps are not fertile? 11:18 Now we are getting down to specifics. We are going to look at Heat Shock Protein 90 (Hsp90) which maintains phenotypes — keeping things the same — and facilitates evolution. She takes us through the steps through which Hsp90 inhibitors enable different protein folding events to take place. She emphasizes that this is an oversimplified account, but that at least the basic picture Hsp90 can in fact aid a mutant protein forms to fold appropriately — thus providing a crucial molecular-level mechanism to permit the fine grained work of evolution to take place. Next step: fungal drug resistance. Resistance is as ever a great way to enter into the fact of evolution. She says, “mutations simultaneously solve and create problems” — which is true both in the formulation of drug resistance and in evolution more generally. Lindquist then returns to a diagram she’s put up before which looks at cellular circuitry ; it’s a crowded, unreadable diagram, which is the point for Lindquist: Hsp90 is all over the connections between events in the circuit, mediating the commands expressed in the genome as they unfold in the cell. That leads to another point: the diagram captures the idea I was trying to express in this post: that the “environment” of genes begins right at any given gene’s door. Further to that point: Lindquist describes forcing evolution in an Hsp90 – involved trait in flies by both genetic techniques — selective breeding — and by selection pressures induced by external, chemical stresses. Mutations accumulate (genes) and manifest themselves in living organisms in response to stress (environment)…which is, among much else, one way to get rapid evolution of a trait within a population. To hand the stage back to Lindquist: she talks of the “translation” of genetic traits into phenotypes, what critturs (and plants and fungi) actually experience. Conclusion: getting to an understanding of a “plausible mechanism for understanding rapid evoluiton.” That is: environmental stress affecting the machinery of protein folding allows hidden variation to manifest itself in biologically (and evolutionarily) significant ways. Starts us off with the basic structure of the human eye: cornia, iris, lens, photorecepters, and pigment (for directional information). Basic story: each structure has evolved independently; the one common element: photoreception, turning photons into electrons. The key reminder: light is the primary selection pressure on the eye. Depending on what function you are interested in, eyes respond to specific properties of light. E.g. scallops have eyes sensitive to light intensity; jumping spiders have several eyes tuned to different functions: the jumping eyes are sensitive to parallax; others look for mates and so on. Subtext: nature, and natural selection, produce so many really cool surprises. Taking a different tack: mimicry in animals turns on properties of potential predators’ eyes. Same thematic point above: natural selection has produced an extraordinary range of adaptations…and with the subtext: ID cannot in any satisfying way account for this. 12:05. Moving to history of eye evolution studies. Lovely story of how eye research turns on the carniverousness of the US, choosing to raise cows and eat them yielded buckets full of large eyes available for biochemical studies. Eat steak and advance science! More seriously, Fernald traces the competing hypotheses of many origins to eyes vs. a single origin, coming to rest on the multiple origins for eyes, coopting properties for different solutions. 12:20 Next, Fernald goes through the sequence of molecular studies to find the genetic origins of eyes — which have been shown to be diverse. When organisms need eyes, or when eyes need a lens protein, e.g., they grab one that possesses the basic properties needed across a wide range of possibities. Result: lenses (among much else in the eye, can be shown to have evolved many times independently. The cool thing here from a science communication perspective is the way Fernald is building an incredibly powerful picture of the detailed facts and processes of evolution, and, barring his opening remarks (and, I’m going to hazard a guess, his conclusions) he has no need to mention the obvious: who needs a Designer when you have such a compelling picture of evolution as handyman, grabbing the nearest available tool to do the job. The story continues with the account of the photoreceptor cascade, in which we learn recent work has undone the older picture of distinct invertebrate and vertebrate cascades; now we find that each division of animals have organisms within them that employ both (or at least bits of both) forms, heedless of what the textbooks told them what to do. The surprising twist to this already surprising story: different eye types collaborate, rather than compete within organisms to deliver information to the eye…. Moving towards the conclusion, Fernald now looks at the question of how eyes could evolve — how fast, how valuable at different stages or pathways to the analysis of information of light, and the answer in model runs is not that long: half a million years from flat sheet of photosensitive cells to a vertebrate eye — with lots of functionality available along the way. 12:30 The same subtext as above emerges: the growing knowledge of the multiple pathways and crossovers between pathways to make eyes creates a picture that satisfies the evolutionary picture and dashes any of the foolishness from ID types trying to resurrect the Victorian criticism of Darwin based on the seeming impossibility of the evolution of a complex eye from simpler origins. Fernald ties this together thusly: eyes are made of multiple parts, each with a discoverabe history; phototransduction oldest, and with the fewest solutions (2) known so far to have survived; Optics are really important; and the history of the eye involved repeated evolutionary invention. To bring this back to John Durant’s talk at the beginning of this session: the theory of evolution depends incredibly strongly on natural history. That was true for Darwin; Fernald’s talk reveals how much that is still true. The observational focus of natural history has become more subtle — but the discovery of varieties of different eyes and all the details of the molecular natural history of the different paths to photodetection are driving an every richer understanding of the way natural selection actually works day by day in the real world. Good times! 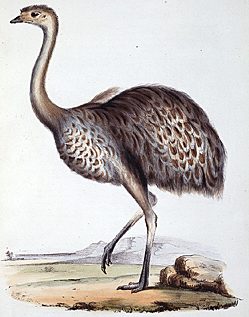 Images: John Gould “Rhea Darwinii,“ from The Zoology of the Beagle. Janet Browne writes of the close call this Rhea had: Darwin shot and mostly ate his only specimen before realizing that what he had was not a juvenile example of another, larger Rhea, but a new species. 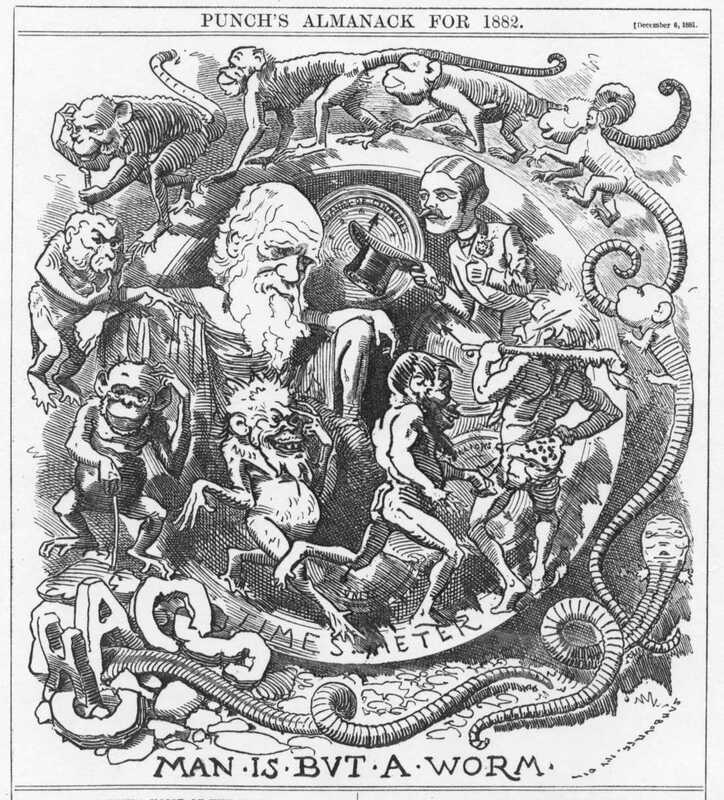 Punch Almanack, 1883, “Man is but a Worm” published 1881. Gaetan Lee, “Human Brain in a Vat,” 2007. 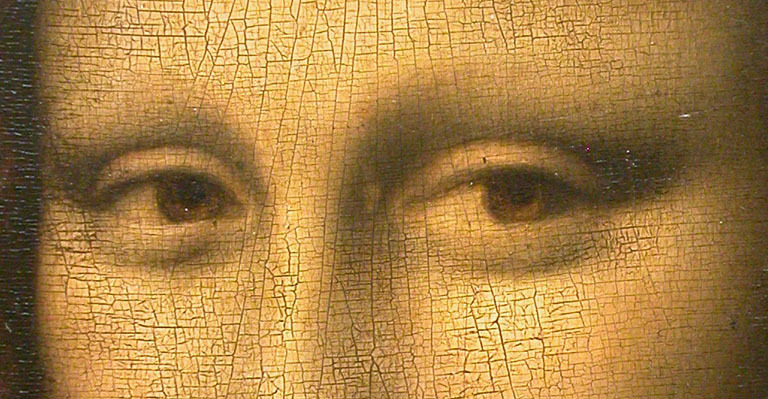 Leonardo da Vinci, Mona Lisa, (detail). This entry was posted on January 23, 2009 at 9:43 am and is filed under Darwin, evolution, MIT, Uncategorized. You can subscribe via RSS 2.0 feed to this post's comments. You can comment below, or link to this permanent URL from your own site.